Is this just too priceless? Hannah is used to having Mom clean her up after snack and meal time. 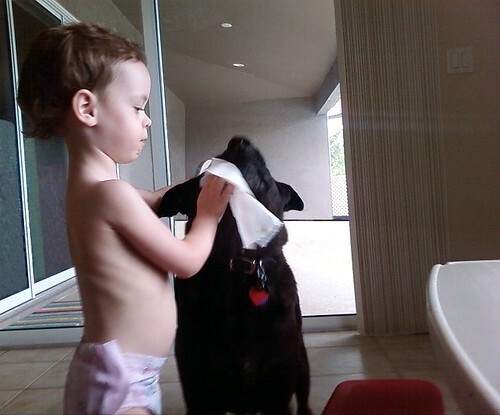 So if Dweezil the dog shares the food he has to get wiped down, too! Hannah grabbed a baby wipe and cleaned the peanut butter off Dweezil's face. He's part Pit Bull and American Staffordshire Terrier, but is so gentle with the Twins it belies all the bad press these breeds unfairly get. This was a totally spontaneous act by Hannah and the fact that the dog cooperated (mostly) just amazes me!